The Auburn Tigers football program represents Auburn University in the sport of American college football. Auburn competes in the Football Bowl Subdivision (FBS) of the National Collegiate Athletic Association (NCAA) and the Western Division of the Southeastern Conference (SEC). Auburn officially began competing in intercollegiate football in 1892. The Tigers joined the Southeastern Conference in 1932 as one of the inaugural members of the conference and the Tigers began competing in the West Division when the conference divided in 1992. Auburn officially claims two national championships. Auburn has achieved twelve undefeated seasons and won twelve conference championships, along with eight divisional championships. The Tigers have made 43 post season bowl appearances, including 12 historically major bowl berths. The Tigers have the 13th most wins in FBS history with over 700 victories and have finished ranked in the Top 25 of either the AP or Coaches polls 37 times, including finishing in the top ten 18 times (ranked 12th nationally for top ten finishes). The Tigers have produced three Heisman Trophy winners: quarterback Pat Sullivan in 1971, running back Bo Jackson in 1985, and quarterback Cameron Newton in 2010. Auburn has also produced twenty-nine consensus All-American players. The College Football Hall of Fame has inducted a total of 12 individuals from Auburn, including eight student-athletes and four head coaches: John Heisman, Mike Donahue, Ralph Jordan, and Pat Dye. Jordan, who coached from 1951 to 1975, led Auburn to its first national championship and won a total of 176 games, the most by any Auburn coach. Auburn's home stadium is Jordan–Hare Stadium, which opened in 1939 and becomes Alabama's fifth largest city on gamedays with a capacity of 87,451. Auburn's arch rival is in-state foe Alabama. The Tigers and Crimson Tide meet annually in the Iron Bowl, one of the biggest rivalries in all of sports. The Tigers are currently led by head coach Gus Malzahn. In terms of winning percentage, Auburn ranks as the 9th most successful team in the past 25 years with a 71% win rate (213–86–5) and 9th over the last half century (1955–2010) with 69%. Of the 93 current I-A football programs that been active since Auburn first fielded a team 116 years ago, Auburn ranks 14th in winning percentage over that period. The College Football Research Center lists Auburn as the 14th best college football program in history, with eight Auburn squads listed in Billingsley's Top 200 Teams of All Time (1869–2010). The Bleacher Report placed Auburn as the 18th best program of all time in their power rankings conducted after the 2010 season. In 2013, College Football Data Warehouse, a website dedicated to the historical data of college football, listed Auburn 13th all-time. After the 2008 season, ESPN ranked Auburn the 21st most prestigious program in history. The Associated Press poll statistics show Auburn with the 11th best national record of being ranked in the final AP Poll and 14th overall (ranked 503 times out of 1058 polls since the poll began in 1936), with an average ranking of 11.2. Since the Coaches Poll first released a final poll in 1950, Auburn has 26 seasons where the team finished ranked in the top 20 in both the AP and Coaches Polls. Auburn has also had success against teams ranked number one in the nation. The Tigers have beaten seven teams ranked number one in either the AP, Coaches, Bowl Championship Series (BCS), or College Football Playoff (CFP) rankings. The BCS was created in 1998 to guarantee bowl game matchups between the top teams, including a national championship game between the two top-ranked teams. The BCS was discontinued in 2014 and replaced by the CFP, which organizes a four-team playoff and national championship game. Five Auburn teams have been awarded a national championship from NCAA-designated major selectors—1913, 1957, 1983, 1993, and 2010.:111–115 The 1957 and 2010 championships are consensus national championships:120 and claimed by the university. † Ineligible for the SEC Championship Game and postseason bowl game. The 1913 team was coached by Mike Donahue and was undefeated at 8–0, outscoring opponents 224–13. Auburn, led by senior captain Kirk Newell, finished as SIAA champions for the first time in school history. Newell, also a member of the Upsilon Chapter of Pi Kappa Alpha, went on to be a World War I hero and member of the Alabama Sports Hall of Fame. The Tigers were awarded a national title by the Billingsley Report under their Billingsley MOV (margin of victory) formula, one of two formulas used by Billingsley. The 1957 Auburn Tigers, led by coach Ralph "Shug" Jordan, finished with a perfect 10–0 record, marking the school's first ever SEC championship. Auburn was recognized as national champions by the AP Poll even though they were on probation and did not participate in a bowl game. This was the school's first recognized national championship. The 1957 title is shared with Ohio State, who was named the national champion by the Coaches' Poll. This was the first of only two times in the history of the AP championship that it was awarded to a team on probation not allowed to participate in a bowl game (it would occur again in 1974 with Oklahoma). The 1983 Auburn Tigers, led by head coach Pat Dye and running back Bo Jackson, finished 11–1 after playing the nation's toughest schedule. Their only loss came against No. 3 Texas, who defeated the Tigers, 20–7. Auburn went on to defeat No. 8 Michigan, 9–7, in the Sugar Bowl. Despite entering the bowl games ranked third in both major polls, and with both teams ranked higher losing their bowl games, the Tigers ended ranked third in the final AP poll. The New York Times ranked Auburn number one at the conclusion of the season, but several other retroactive polling found Auburn at number 1, including the Billingsley Report. The universally recognized national champions for 1983 are the Miami Hurricanes. Head coach Terry Bowden led the 1993 team to a perfect season in his first year on the Plains. The Tigers were the only undefeated team in major college football, however were banned from playing on television or post-season games due to NCAA violations. Rival Alabama was sent to the SEC Championship Game as the substitute representative of the Western Division. Auburn finished ranked fourth in the nation by the Associated Press. However, Auburn was on NCAA probation in 1993 and ineligible for post season play. The Tigers, led by second year head coach Gene Chizik, completed a 12–0 regular season record and defeated South Carolina in the 2010 SEC Championship Game. On October 24, 2010, Auburn was ranked first in the BCS polls for the first time in school history. On January 10, 2011, Auburn defeated Oregon in the BCS National Championship Game in Glendale, Arizona, 22–19. It was the school's second claimed national title, but their first undisputed title. Their quarterback, Cam Newton, became the Tigers' third Heisman Trophy winner. He had a total of 2,854 yards passing and 30 passing touchdowns. He also rushed for 1,473 yards and 20 touchdowns. Auburn officially has won 12 total conference championships, including three SIAA Championships, one Southern Conference Championship, and eight SEC Championships. Since divisional play began in 1992, Auburn has won the SEC Western Division championship and gone on to the conference title game on 6 occasions and is 3–3 in the SEC Championship Game. The most recent appearance came in 2017, as Auburn completed the regular season 10–2, and lost to Georgia, 28–7, in the 2017 SEC Championship Game. Auburn has also shared the western division title, but did not play in the championship game due to tiebreakers on three occasions. Auburn also finished the 1993 season in first place in the division but was not eligible for the division title. Auburn has had 25 head coaches, and 1 interim head coach, since it began play during the 1892 season. From 2013 to present, Gus Malzahn has served as Auburn's head coach. The team has played more than 1,150 games over 119 seasons. In that time, seven coaches have led the Tigers in postseason bowl games: Jack Meagher, Ralph Jordan, Pat Dye, Terry Bowden, Tommy Tuberville, Gene Chizik, and Gus Malzahn. Billy Watkins, Mike Donahue, Chet A. Wynne, Jordan, Dye, Tuberville, Chizik, and Malzhan won a combined twelve conference championships. During their tenures, Jordan and Chizik each won national championships with the Tigers. Auburn trails 36–46–1 through the 2018 season. Auburn leads 43–38–2 through the 2017 season. Auburn trails 56–58–8 through the 2017 season. Auburn leads 47–41–4 through the 2017 season. Auburn trails 22–30–1 through the 2018 season. Auburn leads 28–22–3 through the 2018 season. Auburn trails 17–14–6 through the 2018 season. Auburn leads 34-15-2 through the 2018 season. Before each Auburn home football game, thousands of Auburn fans line Donahue Drive to cheer on the team as they walk from the Auburn Athletic Complex to Jordan–Hare Stadium. The tradition began in the 1950s when groups of kids would walk up the street to greet the team and get autographs. During the tenure of coach Doug Barfield, the coach urged fans to come out and support the team, and thousands did. Today the team walks down the hill and into the stadium surrounded by fans who pat them on the back and shake their hands as they walk. The largest Tiger Walk occurred on December 2, 1989, before the first ever home football game against rival Alabama—the Iron Bowl. On that day, an estimated 20,000 fans packed the one block section of road leading to the stadium. According to former athletic director David Housel, Tiger Walk has become "the most copied tradition in all of college football". There are many stories surrounding the origins of Auburn's battle cry, "War Eagle". 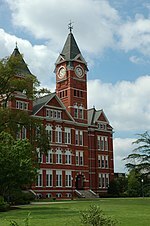 The most popular account involves the first Auburn football game in 1892 between Auburn and the University of Georgia. According to the story, in the stands that day was an old Civil War soldier with an eagle that he had found injured on a battlefield and kept as a pet. The eagle broke free and began to soar over the field, and Auburn began to march toward the Georgia end-zone. The crowd began to chant, "War Eagle" as the eagle soared. After Auburn won the game, the eagle crashed to the field and died but, according to the legend, his spirit lives on every time an Auburn man or woman yells "War Eagle!" The battle cry of "War Eagle" also functions as a greeting for those associated with the University. For many years, a live golden eagle has embodied the spirit of this tradition. The eagle was once housed on campus in The A. Elwyn Hamer Jr. Aviary (which was the second largest single-bird enclosure in the country), but the aviary was taken down in 2003 and the eagle moved to a nearby raptor center. 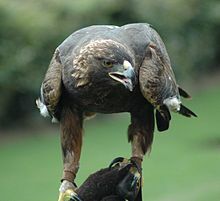 The eagle, War Eagle VI (nicknamed "Tiger"), was trained in 2000 to fly free around the stadium before every home game to the delight of fans. The present eagle, War Eagle VII (nicknamed "Nova"), continues the tradition. War Eagle VI is believed to be the inspiration behind the 2005–2006 Auburn Cheerleading squad's chant, "Tigers, Tigers, Gooooooo Tigers!" The intersection of Magnolia and College streets in Auburn, which marks the transition from downtown Auburn to the university campus, is known as Toomer's Corner. It is named after Toomer's Drugs, a small store on the corner that has been an Auburn landmark since 1896. Hanging over the corner were two massive old oak trees, planted in 1937, and whenever there was cause for celebration in the Auburn community, toilet paper could usually be found hanging from the trees. Also known as "rolling the corner", this tradition originated after Auburn upset No. 2 Alabama in the 1972 Iron Bowl, The famous 'Punt Bama Punt' Game. "We beat the 'number 2' out of Alabama." Until the mid-1990s the tradition was relegated to only to celebrating athletic wins. The oak trees were cut down by the university in April 2013, as a result of them being poisoned by Harvey Updyke Jr., a fan of rival Alabama. The Wreck Tech Pajama Parade originated in the 1930s, when a group of mischievous Auburn ROTC cadets, determined to show up the more well-known engineers from Georgia Tech, sneaked out of their dorms the night before the football game between Auburn and Tech and greased the railroad tracks. According to the story, the train carrying the Georgia Tech team slid through town and didn't stop until it was halfway to the neighboring town of Loachapoka, Alabama. The Georgia Tech team was forced to walk the five miles back to Auburn and, not surprisingly, were rather weary at the end of their journey. This likely contributed to their 45–0 loss. While the railroad long ago ceased to be the way teams traveled to Auburn and students never greased the tracks again, the tradition continues in the form of a parade through downtown Auburn. Students parade through the streets in their pajamas and organizations build floats. A number of Auburn players and coaches have won national awards, including 66 players being named as college football All-Americans. The Tigers also have eleven coaches and players that have been inducted into the College Football Hall of Fame in Atlanta. ^ "Prestige Rankings: Scoring system explanation". ESPN. ^ "AUBURNTIGERS.COM :: Auburn University Official Athletic Site Auburn University Official Athletic Site :: Football". auburntigers.com. Retrieved 7 July 2016. ^ "I-A Winning Percentage 1986–2010 (25 years)". Stassen College Football Information. 2011. Retrieved 21 January 2011. ^ "I-A Winning Percentage 1955–2010". Stassen College Football Information. 2011. Retrieved 21 January 2011. ^ "I-A Winning Percentage 1892–2010". Stassen College Football Information. 2011. Retrieved 21 January 2011. ^ "Billingsley's All Time Top Programs". College Football Research Center. 2011. Archived from the original on July 8, 2011. Retrieved 21 January 2011. ^ "Billingsley's Top 200 Teams of All Time". College Football Research Center. 2011. Archived from the original on July 8, 2011. Retrieved 21 January 2011. ^ Joe Penkala. "College Football". Bleacher Report. ^ "College Football Data Warehouse". cfbdatawarehouse.com. Archived from the original on November 8, 2012. ^ "Auburn Rankings". cfbdatawarehouse.com. Archived from the original on July 23, 2014. ^ "College Football Prestige Rankings: Nos. 21–119". 2009. Retrieved 14 February 2010. ^ "Final AP Poll Appearances Summary". AP Poll Archive. 2011. Retrieved 21 January 2011. ^ "Total AP Poll Appearances Summary". AP Poll Archive. 2011. Retrieved 21 January 2011. ^ "Auburn in the Polls". College Football Data Warehouse. 2011. Archived from the original on December 5, 2010. Retrieved 21 January 2011. ^ a b "2017 Media Guide" (PDF). auburntigers.com. Auburn Athletics. Retrieved May 3, 2018. ^ a b 2018 NCAA Football Bowl Subdivision Records (PDF). National Collegiate Athletic Association. August 2018. Retrieved January 4, 2019. ^ Christopher J. Walsh (2007). Who's #1? : 100-Plus Years of Controversial National Champions in College Football. Taylor Trade Pub. pp. 35–36. ISBN 978-1-58979-337-8. ^ "National Championships". Auburn Tigers: The Official Website of Auburn Athletics. 2016. Archived from the original on January 4, 2019. Retrieved November 13, 2016. ^ "Alabama Sports Hall of Fame and Museum – Birmingham, Alabama". ashof.org. ^ National Collegiate Athletic Association (NCAA) (2015). "National Poll Rankings" (PDF). NCAA Division I Football Records. NCAA. pp. 105–106. Archived from the original (PDF) on 2016-05-21. Retrieved January 3, 2016. ^ "Auburn to name Chizik as coach". ESPN. December 15, 2008. Archived from the original on March 29, 2010. Retrieved 11 March 2010. ^ The National Collegiate Athletic Association (NCAA). "National Poll Rankings" (PDF). 2010 NCAA Division I Football Bowl Subdivision Records. NCAA.org. pp. 68–77. Archived from the original (PDF) on 2012-05-16. Retrieved 11 March 2011. ^ "The best Walk in America". ESPN. 2003. Archived from the original on October 8, 2007. Retrieved 13 October 2007. ^ "Finebaum on college football's craziest rivalry". ^ Barnhart, Tony (2000). Southern fried football: the history, passion, and glory of the great Southern game. Triumph. p. 49. ISBN 978-1-60078-093-6. ^ "AuburnTigers.com – Official Athletics Site of the Auburn Tigers – Traditions". auburntigers.com. ^ "Heisman Trophy Winners". heisman.com. Archived from the original on December 9, 2007. Retrieved 14 December 2007. ^ Alder, James. "Walter Camp Award Winners". About.com. Archived from the original on January 7, 2008. Retrieved 14 December 2007. ^ "All-Time Outland Trophy Winners". Football Writers Association of America. Retrieved 14 December 2007. ^ "The Rotary Lombardi Award Website – Winners". Rotary Club of Houston. Retrieved 14 December 2007. ^ "The Jim Thorpe Award – Past Winners". The Jim Thorpe Association. Archived from the original on November 11, 2007. Retrieved 14 December 2007. ^ "Rimington Trophy". Retrieved 10 December 2014. ^ "Paul "Bear" Bryant Previous Winners" (PDF). American Heart Association. Retrieved 14 December 2007. ^ "Home Depot Previous Winners". Home Depot. Retrieved 8 December 2010. ^ "Chizik picks up another coaching honor". ESPN. Retrieved 7 March 2011. ^ "Former Winners of the Broyles Award". Rotary Club of Little Rock. Archived from the original on November 9, 2007. Retrieved 14 December 2007. Wikimedia Commons has media related to Auburn Tigers football.